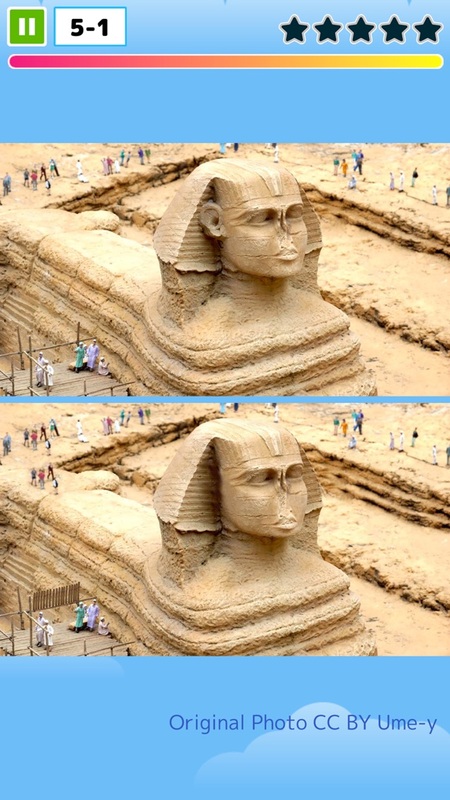 Spot the Difference with beautiful photos! A light app for time-killing! The Spot the Difference's rules are simple! 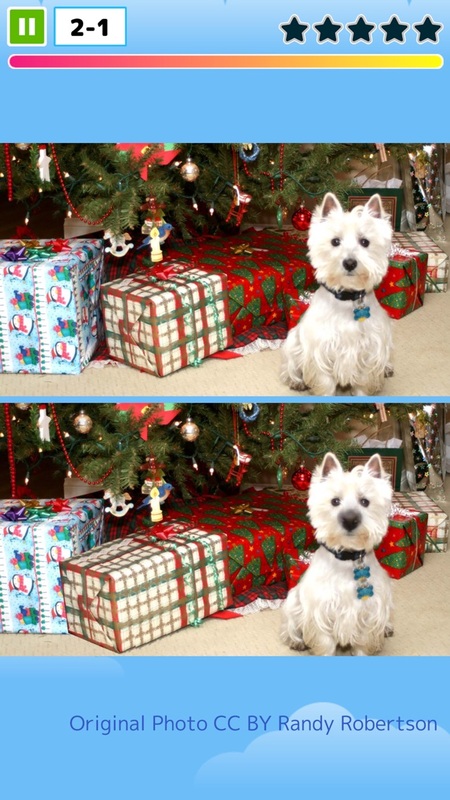 Each pair of pictures have 5 differences. Tap and touch to find them all! There are so many styles of pictures it's hard to list them all: Famous holiday destinations, Beautiful backdrops, Normal workspace environments, Sometimes even funny pictures that will make you laugh! Highly recommended for iPad users who can experience the pictures in their true brilliance! The rules are simple: within 60 seconds, find and touch the 5 spots in each pair of pictures that is different! Just be careful: Tap somewhere that is the same in both pictures and you'll lose a life! Lose all your lives and you'll have to try again! Tap 3 out of the 5 points to go on to the next level in this fun and easy free light puzzle game! Battle with friends and people from around the world to get as many stars (points) as you can! Recommended for people who want a brain stimulating game while they relax; take a rest and step back from your busy life whilst waiting for the bus or train on your way to work or school. Test your attention and information processing capacity whilst exploring from your sofa! Get lost within the images which look even more marvelous on your iPad! Test your prefrontal cortext in this brain-training and concentration tester! Perfect for killing some time, and better yet: it's a free download! No need to register your email address! Please enjoy yourself with The Spot the Difference! AfroCat ◆ Cute and free pet game ◆ Perfect for passing the time! AfroHamsterPlus ◆ The free Hamster collection game has evolved! My Tiny Bear ◆ A pet in your pocket! 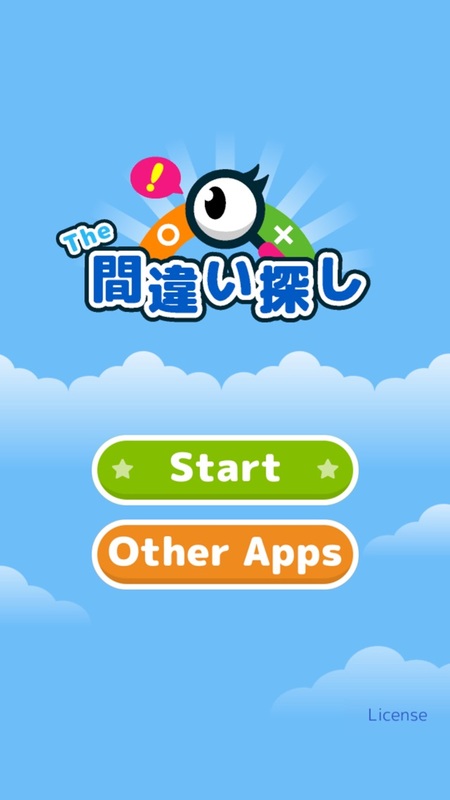 Cute and Free game! Fortune AfroHamster ◆ Save Japan with Afros of Happiness! AfroHamster Solitaire Great for time killing or brain training! Samegame Zoo - Cute animal action puzzler! Samegame Puzzle - TINY TWIN BEARS ◆ Free app from The Bears' School! AfroHamster Spider●Great for time killing or brain training!